Board MLM Software A board plan where board always split when full and the board leader graduates to the second board that is revolving. The other members should be shared among the two boards based on their position and the number of members they have recruited. the board plan with split system where members advances based on the number of referrals. Each member can refer up to two members, any other referral spills over. after completion of first board, they are automatically entered into a second board where they revolve forever. 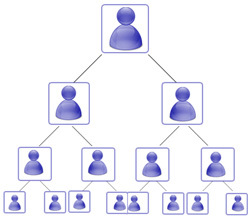 if board is full, the leader advances to the second board and the board is split into two for the current member, position is selected by first looking for member with two referrals to occupy the first levels and following from left to right and top to bottom, then those with single referrals are considered next and those with no referrals are considered next. then the last level remains empty to be filled from left to right. upon entering the second board, they follow their leader to the leader's board.